Here?s a sweet way to pretend! 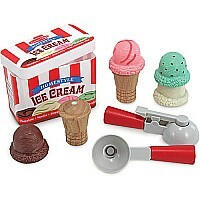 The Scoop & Stack Ice Cream Cone Playset serves up everyone?s favorite treat. Scoop the ice cream from the container using the special magnetic scoop. Go ahead, make it a double! For ages 3-6 yrs.